Greengill Farm Barn in Greengill, near Wigton, Cumbria sleeps 6 people. Greengill Farm Barn near Wigton is a semi-detached barn conversion set on a working beef and arable farm, close to the traditional village of Gilcrux on the fringes of the Lake District National Park. It has been thoughtfully designed, with each ground floor bedroom having a walk-in shower room, and the living, dining and kitchen area being located on the first floor. The property is beautifully presented and makes a comfortable base to return to after a day exploring the region. 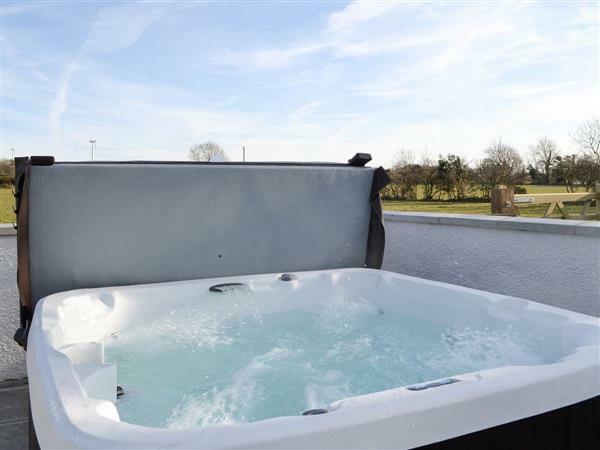 There is also the benefit of a private hot tub, which you can sink into with a glass of bubbly! Gilcrux, 1 mile, can be reached along a quiet country lane, and you can take a pleasant evening stroll there in summer for a meal or drink in the village pub or bistro. Ideally located, Greengill Farm Barn is well placed for exploring the highlights of both the northern and western Lakes. The traditional market town of Cockermouth, birthplace of William Wordsworth, and the bustling lakeside town of Keswick both have a wide selection of attractions and are within a 20-minute drive of Greengill Farm Barn. A perfect cottage in a perfect location. The beach is 5 miles from Greengill Farm Barn near Wigton. With the shop 5 miles, and the pub & restaurant are 1 mile from Greengill Farm Barn. Bedroom 2: With double bed, Freeview TV and en-suite wet room with shower and toilet. Bedroom 3: With zip and link twin beds (can be super king-size on request), Freeview TV and en-suite wet room with shower and toilet. Living area: With electric fire, Freeview TV, DVD player, iPod dock and Wii. Kitchen area: With electric cooker, microwave, fridge/freezer, wine chiller, dishwasher, instant hot water tap and washing machine. Oil central heating, electricity, bed linen, towels and Wi-Fi included. Welcome pack. Enclosed lawned courtyard with sitting-out area and garden furniture. Hot tub for 6 (private). Bike store. Private parking for 3 cars. No smoking. Holidays at Greengill Farm Barn run from Saturday to Saturday. For a better idea of where Greengill Farm Barn is, you can see Greengill Farm Barn on the map below. Greengill Farm Barn is in Cumbria; should you be on the lookout for a special offer, you can find all the special offers in Cumbria. It's always worth checking to see what is on offer at the moment. Do you want to holiday near Greengill Farm Barn (UKC2768), you can see other cottages within 25 miles of Greengill Farm Barn; have a look to find your perfect holiday location.